The incredible design possibilities unleashed by parametric design software mean there is almost no limit to the eccentricity and expressiveness of today’s skyscrapers. Reconciling these designs to a built reality is another matter, requiring top-level coordination between architect, engineer and contractor. 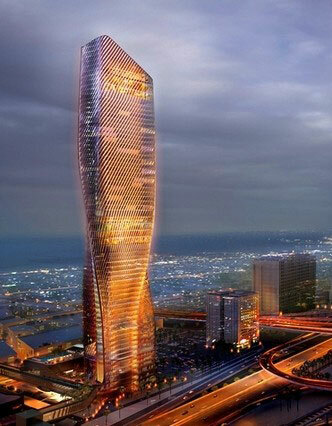 Such is the case at Al Wasl Tower, which has an unusual “contrapposto” shape, which “faces” in every direction, necessitating a complex, sinuous cladding strategy combined with a disciplined and efficient structural grid. Its “breathable” skin is comprised of one of the tallest ceramic façades in the world, which shades and ventilates the interior, and is dramatically lit at night by autonomously generated patterns. This program included a presentation and site tour at the under-construction Al Wasl Tower, which will house a Mandarin Oriental hotel and serviced apartments and is scheduled to be finished before Expo 2020 begins. The same program will run in the morning and afternoon.